The professional cinema installs featured in HCC sometimes look like part of the lifestyle of the rich and famous – and here that's most certainly the case. 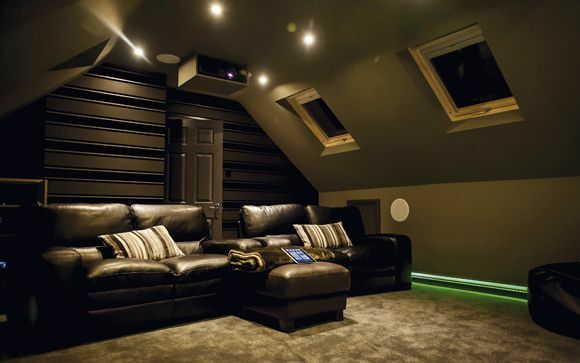 This impressive 16th century barn conversion in Oxfordshire, brought up to 21st century standards via some cutting-edge home automation and AV hardware, is where British Touring Car legend and Fifth Gear presenter Jason Plato kicks back after a hard day behind the wheel. Because, although driving cars at ridiculous speeds is his passion, he's also a bit of an AV freak, and has been known to pop down to the Bristol Sound & Vision Show in the past. The centre point of the barn is the projector-based cinema setup, but the entire house is tech-savvy. Security, the Lutron HomeWorks lighting scheme and the 12-zone heating system are all controlled by a high-spec AMX solution. A series of touchpads, remotes and wall-mounted keypads means Jason and his family can keep on top of everything, including the multiroom audio system and video intercom, should Tiff Needell keep popping round uninvited. The AMX home network even extends to the outbuilding from which Jason runs his management company. The house features a plethora of Pioneer Kuro screens, in 42in, 50in and 60in flavours, fed by an 8x8 HD matrix switcher in the main kit rack. Some of the Kuros are mounted on automated lifts – others, like the 60in model in the high-ceilinged main room, are wall mounted. Control of all the sources and display technology is done via a wireless AMX Modero touchpanel. A single button press is all that's required to dim the lights and bring down the blinds and projector screen. Then it's a matter of browsing the Kaleidescape library and choosing a flick. For audio, the room features a 5.1 array of KEF's high-end Reference speakers – like the Kuro TVs, these have been around for a while, but offer an astonishing performance, even in a room that's not quite acoustically perfect.